At last back in The Green Room! Celtic to make Lanarkshire a Scottish Cup free zone. FT; Arbroath 4 – 3 Celtic XI – A Danny Denholm hat trick and a debut goal by Greig Spence sealed the win for the Lichties. Two penalties by Armstrong Oko-Flex and a goal by substitute Savoury made an exciting final few minutes! CELTIC: Bain; Ralston, Boyata, Benkovic, Izaguirre; Forrest, McGregor, Brown, Christie, Forrest, Sinclair; Burke. come on the Celtic…..get this finished in the first half…. Progress is all that matters today. Performance isn’t as critical as the result. That said, I’d love a classy performance with a big win to get us back on track. GG4 hopes going up in smoke as The Sheep struggle against Stenhousemuir, who’ve conceded over 60 goals ( I think ) this season. While Hibs put Elgin City to the sword. someone put that team up a few hours ago on another site. Not much of a report to offer, I`m afraid. Arbroath 5 Celtic Select 3 ( Two pens). If Gutman was playing , I cannot say I noticed him. Kundai Benyu moved well but flattered to deceive. Calvin Millar behaved like the big I am and deserves a rollicking from Damon Duff. The No 4, at centre half, looked good. The highlight of the day was the appearance of Karamoke Dembele. He cam on for 15 minutes. 5-1 when he started, 5-3 when the game ended. He looked special. Arbroath were the better side and they all played well so if Luke was on, he must have played well as well !! The pitch, which is 50 miles from Cowdenbeath and on the same side of Scotland, was perfectly playable. Welcome back to Nir Bitton. It`s been a tough year for him . Although prone to error, he is a player I like. Mental team selection — 2018/19 — Episode 6. Not sure if points are being made regarding the current state of the squad but the team looks as if it has been picked by lottery number. RB — interesting / so much wages just sitting about. MF — Worst case is SB passes the ball everywhere but forward and CMcG evaporates for 80 minutes. LW — ScS is a very lucky boy to get a game after this season. Surely he can play with some confidence against lower league defenders. RW — JF / who will turn up? Super J — Goal scorer of some repute determined to take control of the game. Waste of Space J — Scared of his own shadow who just wants to be left alone. CF — OB / OMG things are getting interesting and then some. Looks a very disjointed team. Interesting to see who hasn’t made it to the bench. 2019 Jan spend — More on PL’s bonus than squad development. I fear DD is just trying to wind up the support. Hump thum Celtic – one – nil, no injuries and great performances from our debutantes. Yuv goat tae Luv them currants! Crapped it from the Bloo Brazil. On a cold but sunny day we faced the Pars in the first round proper of the SC at Parkheid. I was working with the nations largest home builder on the high flats at Ruby Street, a young Vic Davidson lived close by, so I wandered along to the game. We had dropped a point to deidco in a very rough game and had no game for 3 weeks due tae inclement weather, the wee mhan was in no fit condition to play at Easter Road in our first match since then having been barged, kicked and run down by various hun players throughout the game. Wee ten thirty who had to be subbed in the game was also having treatment for a leg injury. and in the interim the huns went 6 points (3 games ahead). This was the winter of the great storm and with the severe weather several players were suffering from the cold and flu as well as the mugging fae the hades hammer throwers, however we still managed a credible 2-0 victory with a side that was missing Brogie, Cairney, Joe McGoals and wee ten thirty with the latter on the bench. So in we went tae this game feeling quite confident although both Luggy and the Buzz Bomb were missing and Stevie was relegated to the bench, in another rough game where even big Tid, with the Pars at the time, was booked for throwing his weight about. However, with r ight h un davidson in charge we were once again cheated, especially when a very good Brogie goal through a ruck of players was chalked off for offside. Lets not forget though that this was a very good Pars side, one that Jock had actually built, and would go on tae win the cup against the calvinists but we were still stunned on exiting the ground after witnessing Celtic going out of the Cup so early on for the first time in 16 years and Jock’s worst domestic result as Celtic manager. We won all our games, including the Glasgow Cup when they failed to show up, the rest of the season, Luggy and Lemon never missed a game again on the run in. and clinched the League on the same day as Jock was watching his old team win the SC at hunden while deidco lost their unbeaten record less than 5 miles away tae the sheep. Lets hope there’s nae repeat the day especially against such a toxic supporting side who had among their board members, peat, ballantyne, the aforementioned davidshun and wee macmillan who refused tae sell us Drew Jarvie, we got Dixie instead so nae loss, and also widnae appoint Daniel Fergus tae the managers job due tae his Tim sounding name. 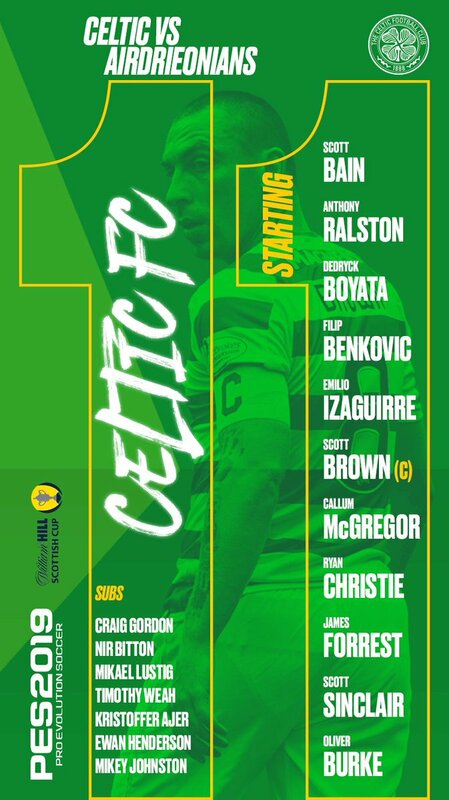 Callum McGregor is in the starting line-up again, so we should be alright. Easily the best and most consistent footballer at the club. Have YETT your posts WMMMS if you wrote AOTWITE? I cannie BB trying to D your As. So looks like I’ll CTSOB. They must have left Ntcham behind in Dubai. Is the draw for the next round now on January 30 after the hun game, widnae put it past them. There’s also 4 big games in england that night ans well as us at hame in our postponed game. Surely their game will no longer be televised with the blue brazil losing money they could obviously do with. Anyone having probs with Celtic TV? *I reckon hes for the joe the toff, he’s worse than a mhan short right now. One of the things I admire about Our Great Club is the way we handle poor questioning from the sleekit meeja with a straight bat. might I just say how appreciative this Tim is of the many great contributors we have to this Dear Green Place…. the genuine characters, the funny stuff, the choons, and the, mad mental stuff and the history buffs who do so much to rebuff the sleekit Guff! Take a bow the lot o’ ye, ye know who ye are! It’s Good To Be a Tim.